national government (known as ‘Representatives of the People on Mission’) who were trying to prevent the dismantling of the machinery of the Terror from degenerating into a new round of violence and persecution. There is also plenty of other material from many different local and national authorities that speaks to the range of challenges facing the French nation and its citizens at this point in the Revolution, from the ongoing demands of European war to issues of subsistence and the disputed role of Catholicism within society. I have now completed the inventory of the John Rylands Library European Proclamations and Broadsides (EPAB), a unique resource containing well over 10,000 items printed all over Europe between c.1530 and c.1890. The inventory complements the digitisation project ‘Revolutionary and Napoleonic France, 1789-1815’ announced previously on this blog, but it provides information on the entirety of EPAB. Although centred on France, this collection also includes material from elsewhere in Europe, including Germany, Italy, Spain and the Netherlands. It is the very first inventory to be made of the collection. Please click on the link below to download a PDF copy of this inventory, or go to the ‘Inventory’ page of this blog for further information (see toolbar at top of page). These notes cover European Proclamations and Broadsides (EPAB) Boxes 20-29 (10 July 1793-31 July 1794), in which the collection takes us through the implementation and impact of the Terror. One area of particular strength here is the number of proclamations by different Representatives of the People on Mission (elected representatives of central government who were sent out all over France to assert its authority, coordinate the war effort and stamp out internal dissent). The actions and beliefs of these individuals could result in significant variations in the local experience of the Terror, and the EPAB collection is – to my knowledge – unique in bringing together so many proclamations by different Representatives, all in the broadside format in which such declarations were intended for dissemination in communes across the country. These boxes also cover the Terror’s ‘revolutionary justice’ against alleged counter-revolutionary conspirators and ‘enemies’ of the Republic. Material dealing with this judicial repression includes the publication of death sentences handed down by the Paris Revolutionary Tribunal and Military Commissions at Tours and Bordeaux. As stated in an earlier blog entry, my research notes are just that: notes, not any kind of finished piece of work. They provide some indication of the content of the collection, along with extended quotes and some very brief comments in places. You may find them spectacularly dull, but equally there be one or two things hidden in there that could be useful for your own research or interests – or may inspire your own visit to the John Rylands Library. I certainly hope so! I am delighted to announce that this project has now overseen the completion of a new digital resource: ‘Revolutionary and Napoleonic France, 1789-1815’. It provides free public access to high-resolution images of 201 items from the John Rylands Library European Proclamations and Broadsides collection (EPAB) via the University of Manchester Library Image Collections portal (LUNA). The picture above shows thumbnails of just under half of these. The digital element is complemented by full University of Manchester Library Catalogue entries. This is the first time that any material from EPAB has been either catalogued or digitised. More information on the project can be found on this blog’s ‘Digitisation’ page (see toolbar at top of page). I would like to add a big ‘Thank you!’ to the John Rylands Research Institute for the additional funding provided for this project, the staff at the Centre for Heritage Imaging and Collection Care who produced the digital images, Suzanne Fagan (John Rylands Library) for coordinating the transfer of all the image data to LUNA, and Christine Stahl and Mary O’Conner (John Rylands Library) for sharing their cataloguing expertise with me. I was very fortunate to be given such great access to the French Revolution Collection during the course of the ‘Printed Revolutions’ project. Although everything from this collection can already be viewed by putting in a request at the John Rylands Library’s public reading room, I am very excited because this digital collection means that everyone can now get a taste of this fascinating material from the comfort of their own home/office/caffeine haunt/daily commute. Click on the picture at the start of this post to access the collection (or go to the ‘Digitisation’ page on this blog). Enjoy! My second set of research notes are now available to view and download via the link below. They cover the content of the European Proclamations and Broadsides collection (EPAB) between 1 July 1792 and 19 August 1793. This period sees a series of dramatic alterations in the French Revolutionary landscape. From July onwards, documents bear witness to the build-up to the Revolution of 10 August 1792 (when King Louis XVI was finally deposed, over three years on from the fall of the Bastille) and its fraught aftermath – including the infamous September Massacres in the prisons of Paris. The collection also provides access to a broad sample of the official output from the National Convention, the new national representative body created as part of the post-10 August constitutional settlement, as well as local authorities from across the country who find themselves under increasing pressure from the demands of a European war and widespread fears of domestic counter-revolutionary conspiracy as 1793 progresses. 1)R198419 Décret de l’Assemblée nationale, du 21 juin 1791 (Paris: Imprimerie de Ballard, imprimeur du département de Paris, rue des Mathurins, c.21 June 1791). ‘Proclamations: French Revolution 1789-1799’, Box V.
2)R198420 Aux Citoyens (Rennes: Imprimerie de J. Robiquet, c.23 June 1791). ‘Proclamations: French Revolution 1789-1799’, Box V.
3)Décrets (Rodez: Imprimerie de Marin Devic, Imprimeur du Département de l’Aveiron [sic], c. 25 June 1791). ‘Proclamations: French Revolution 1789-1799’, Box V.
R198419 (this is a new JRL accession number, generated by this research project), the ‘Decree of the National Assembly, from 21 June 1791’ is a full copy of the immediate, official reaction to the King’s escape from the capital by the nation’s deputies, produced and distributed by the Paris department. Both the simple layout and the absence of any additional content (even counter-signatures) from this departmental authority suggest that the broadside was produced extremely quickly, perhaps even on the same day (the printers were only on the rue des Mathurins, which links the southern parts of the 8th and 9th arrondissement only a short walk from where the National Assembly sat in the Tuileries palace complex). The opening words of the decree itself show that the nation’s deputies were particularly concerned about their audience within the capital: ‘The National Assembly declares to the Citizens of Paris, & to inhabitants of the Empire…’. It is also striking from the two orders at the end of the decree how Parisians were singled out as a revolutionary entity in a way that other parts of the country were not. Thus, in the capital it was required that ‘the Citizens of Paris hold themselves in readiness to act for the maintenance of public order [l’ordre public], & in defence of the Patrie’, whereas everywhere else it was up to the local authorities ‘to guard public order [la tranquillité publique] carefully’. To the left is a copy of the broadside (thank you again to CHIC for producing the image). If you CLICK HERE: R198419 annotated you will find an annotated copy with additional comments and translations. Hopefully the latter (a tactic I will repeat in future) will be particularly useful for any readers who are struggling to make sense of these text-heavy documents! 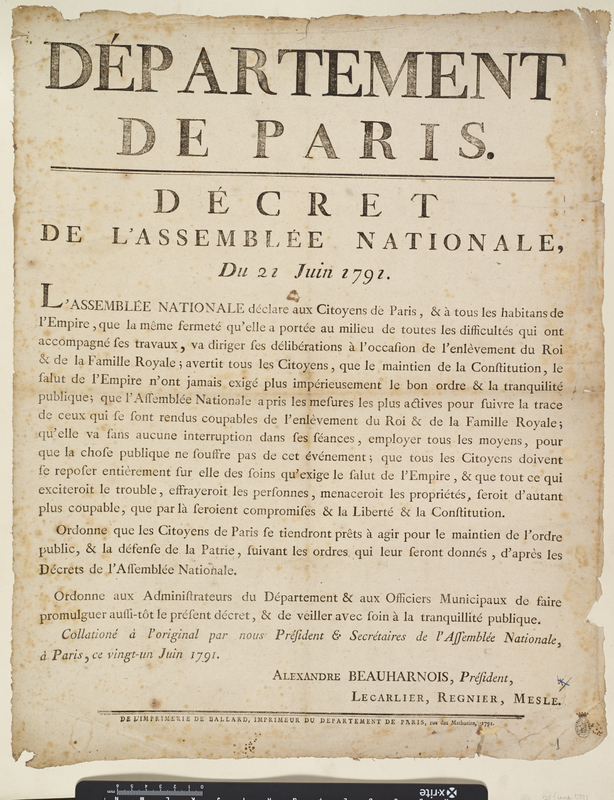 Box 5 of the 1789-1799 set of proclamations contains a number of broadsheets which vividly convey the sweeping repercussions of the French king’s attempted escape from Paris towards the Northern frontier on the night of 20 June 1791. Louis XVI’s attempt to extricate himself and his family from the increasingly unstable and contradictory constitutional settlement fixed in 1789 – whereby the monarchy remained as the executive arm of a state which claimed to draw its sovereignty from the nation as a whole – ended in his capture at Varennes, 125 miles north-east of Paris, and ignominious return to the capital under armed guard. Soon dubbed ‘The Flight to Varennes’, Louis’ action provoked the first mass movement for a republican government, exposed deep divisions in the political class about the limits and ultimate agenda of the revolutionary cause, and led to nationwide repression of suspected ‘counter-revolutionary’ forces such as ex-nobles (nobility itself having been abolished in 1790) and refractory priests. As such, the episode constituted a major challenge to revolutionary authorities right across the country. Within this group of broadsides relating to Varennes (eleven in total) I am particularly interested in three which connect different local authorities to one of the National Constituent Assembly’s earliest responses to the crisis. This was a decree on the day after Louis’ disappearance which was essentially a nationwide appeal to rally the population to the Assembly’s authority. The decree announced the ‘abduction’ of the King and his family – a fiction which was maintained by the political elite long after Louis’ recapture because of the constitutional repercussions of acknowledging France’s executive power had tried to flee the country. It went on to try to assure the population that the National Assembly had the measure of the emergency. Finally, it was also a pre-emptive strike against the disorder (in particular, violence against persons and property) which it was feared would flare up as news and rumour about the King’s disappearance spread. The three broadsides which I have identified provide evidence of how the Aveyron, Ille-et-Vilaine and Paris departments responded to this prompt from the centre, offering a glimpse of the way in which different authorities scrambled to react to the crisis. They demonstrate the importance of print in relaying the government line across the country, but also how easy the printing process made it for local authorities to adapt such messages in the face of events and opinion in their own area. My next post will analyse these items in detail. Please note: This research project has now finished, but additional findings will continue to be uploaded to this blog during 2016. I still welcome comments and questions, which can be directed to this blog or my University of Exeter email address. I am a Lecturer in European History at the University of Exeter, specializing in French Revolutionary studies. I have published research on the implementation of revolutionary justice during the French Revolution, and on print culture during the Terror of 1793-4. I am also interested in the relationship between France and Saint-Domingue/Haiti during the late eighteenth and early nineteenth centuries.